In the corporate world, a CEO’s office is rarely just an ‘office. It will most likely have to function as a meeting room, workspace, mission control, and even board room if it’s a small business. For this reason, it is essential that the space adequately caters for every eventuality. Furniture needs to be functional, but luxurious and of course attractive. Most CEOs are not going to be happy with a generic desk and cheap office chair. Office furniture should reflect the personality of the CEO, so if he or she is a traditional type, a solid rosewood or teak desk might be a good choice, whereas a younger CEO will probably prefer a sleek minimalist design. The desk needs to be large enough to accommodate computers, monitors, a printer, desk lamp, and anything else your CEO needs to function efficiently, without feeling cluttered. Desk storage is useful, but you will need to add extra storage space such as fitted shelving and cupboards for files, books, etc. The aim is to provide enough storage to keep miscellaneous items out of sight. Cluttered offices are the enemy of productivity. Concealed filing cabinets and seamless cabinets are modern and attractive. 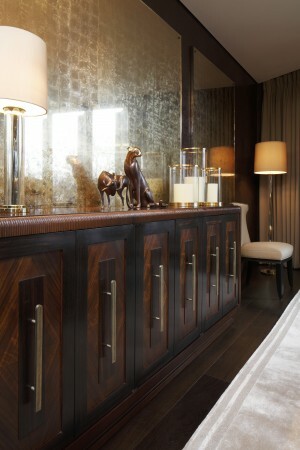 Don’t be afraid to mix and match materials, so if the desk is teak, choose a different material for the cabinetry. Make the most of any natural light you have in the office. Most CEO’s have a premium office, so they can enjoy the best views. If this is the case, floor to ceiling windows are an asset that should not be concealed behind drapes. However, you still need to control light or the room will be too hot or cold. Install electronic window blinds or use a UV reflective window coating. Position the desk so your CEO has his back to the window and faces the entrance door, so he can greet guests as they walk in. Modern or traditional: it’s a personal choice. Once you have chosen the furniture, decide upon a decorative scheme. Muted colours work best for office spaces, as they help to quell stress and promote calm and serenity. Taupe, pale teal and soft blue-grey are all a good choice, although bold accent colours on rugs and soft furnishings also work well. Add vibrancy to a luxurious office space with original artwork and sculptures. Art is always a talking point, as well as an excellent way to express the personality of your CEO. Take great care when designing an office space for a CEO and be wary of adding unnecessary furniture or gadgets that detract from the overall design. Bedrooms should be a place of rest and solitude, after all this is where you will generally unwind from the day and surprisingly spend one third of you're life sleeping. Applying basic feng shui principles to ones bedroom is critical. Simple steps like placement of the bed which should always face the entrance of your room and having your bed up against a solid wall creates strong positive energy. A focal point in any room is important too especially in you're bedroom, you're eye will naturally look for this otherwise there can be a sense of confusion and distortion in the space. Headboards are a great way to create a focal point and over recent years have become a design feature that most designers are keen to be creative with. A bespoke headboard is ofcourse the best solution, clients request something uniquely made for them which will reflect their personality and the scheme of the bedroom. A range of materials can be used from intricate hand cut paterned leather panels to mixture of glass, woods and metal. Another important aspect of ones bedroom is of course lighting. Generally in a bedroom you should consider no more than three different focal points for lights which can range from ceiling, wall and bedside lights, all of which can bring ambience in a room aswell as being functional and practical. With the above in mind bedroom designs should be kept cleanlined and uncluttered whilst introducing a mixture of warm sumptuous materials and textures. Your office reception works much like a website’s front page design. It is the first point of contact that companies and customers have with your business. It is literally the public face of your company. At Casa Forma we make snap decisions about a person within ten seconds of meeting them – we can’t help it it’s human nature. The same is true of decisions about a company and your reception area needs to make a great first impression. We always start with design itself before looking at décor as we need to make sure that the space is optimised correctly to create the right impression. Your reception area should be focused towards the reception desk itself. A large wide desk with computers and your company logo above is normally the best way to make a good first impression. Light is incredibly important in your reception area. Too dark an area makes people feel on edge and detracts from the visual feast you want to serve people. Soft natural light is ideal and you can supplement with overhead spotlights, side lights and mirrors if you don’t benefit from a glass entrance. We also want to make sure that there is a warm and welcoming waiting area. This should be comfortable, branded and feature your company or industry literature – reinforcing the impression that your business is at the top of its game. Materials are also incredibly important but don’t have to be expensive. Traditional businesses will often benefit from rich, corporate or luxury materials in their design. 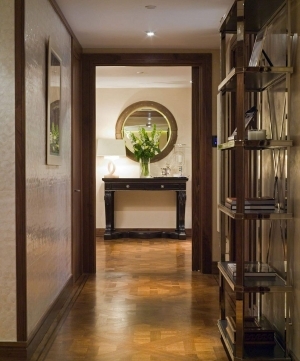 Black marble, rich mahogany and mirrors help create this luxury feel whilst increasing space. However, many more modern businesses, particularly in the tech industry, benefit from the opposite image – relaxed spaces, light colours and a friendly colour scheme. At the end of the day your design needs to reflect your brand and your corporate message. Receptions should feel relaxed, comfortable and not cluttered. Decoration should be kept relatively minimal with brand logos, plants and amenities available. Try to have a few well-chosen and placed objects rather than a clutter. For many companies a focal point piece of art can make an incredible impression but it isn’t a necessity. What furniture you choose is however very important. Chairs and sofas are an ideal solution but you should choose ones that reflect your company – big, soft and comfy if that’s your image or modern and artistic if that’s your image. You should always provide a table for work and refreshments so that guests can quickly settle. How you display your branding and how you design the actual office reception is important. We want to make sure that we convey our core brand messages to potential clients and that our brand is a key association our office makes. Décor such as art, images and corporate awards should feature subtly in your office to contribute to your brand persona. Consistency is also very important. It’s no good making a great first impression in your reception if the rest of your office is cluttered or plain. We want to replicate all of the receptions design and branding throughout your office to make sure that first impression sticks with visitors throughout their stay. Designing a reception well will make the perfect business impression and we can’t recommend it enough! If you need assistance don’t hesitate to contact us directly. When it comes to creating truly unique interiors antiques are often the best objects to build around. They can bring together a room and often have wonderful stories to tell about a time, a place or a history. Choosing antiques is a pleasure in itself and we love visiting antique fairs, auctions and local shops to try and find unique items. With that in mind we thought we’d create a quick guide for anyone looking for antiques to compliment particular designs. The history of antiques is complex and sprawling with British designs taking their names from periods associated with reigns of monarchs. However, there are also antiques that fall into artistic movements, cultural moments and industries – for example maritime antiques. Here we look at some of the most common styles you can access. Art Nouveau ran from 1896- 1914 and embodies a time when jewellery and fashions were changing dramatically. The styles of furniture and art are popularised by curves with sweeping lines and furniture with slimmed upholstery and beautiful elegant curves. This style of furniture wasn’t mass produced so it easy to pick up unique items. This style works exceptionally with modern designs. Victorian antiques cover a broad spectrum of styles but typically the features are heavy wood, furniture with beautiful upholstery, ornate glassware and china. Victorian furniture can work with all styles of design from modern to classical so it is easy to find antiques for any interior decoration style. The Baroque period refers to 17th and 18th century European arts, architecture and style. Baroque furniture and antiques typically feature very ornate carvings with astonishingly beautiful wood and gilt work. Original baroque furniture is highly sought after with a high price tag but there are plenty of modern imitations. 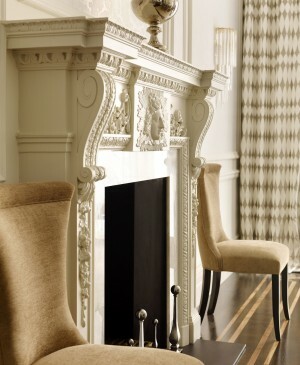 This style works with rich classical designs and any room trying to be opulent. The gothic revival period was short lasting from 1840-1860 but has influenced design and art ever since. Gothic antiques are characterised by dark colours and striking medieval displays. These antiques are highly prized and work in hyper modern design and dark classical libraries or lounges. When it comes to designing around antiques it is very easy to find something you like. We have worked with antiques in all styles and most people tend to have a variety of eras and objects – they are at the end of the day personal objects to choose. If you are planning a single design element it is great to choose one era or style but remember that these periods also produced exceptional plain objects (typically furniture) that can work with all styles. 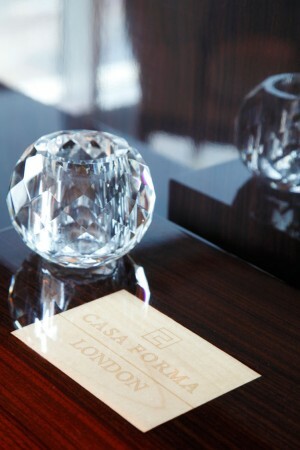 At Casa Forma we specialise in luxury interior design and have been fortunate enough to work on some of the most captivating buildings and projects the world has ever seen. From luxury apartments in Mayfair, hotels in Saudi Arabia to a private yacht in Monaco the Casa Forma team have worked on some incredible locations and projects. However you don’t need to break the bank to create a sense of luxury in your home so today we thought we would share some of our best luxury design tips…on a budget. Colours in your home are what create the first, and biggest impression. If you want to create a luxurious feel you need to choose colours well. Whites and Creams are, perhaps surprisingly for some, some of the best colours to create that luxury feel. They create a sense of space and when you combine them with colours such as black and gold you create an opulent image. Reflective colours and surfaces create a very luxurious feel and even if you can’t splash for white marble floors and black marble walls there are plenty of similarly textured materials available on the market. If this style isn’t you then invest in rich dark colours like reds and browns which create the impression of old fashioned riches. These colours work exceptionally for a traditional design rich with antiques and wood trimmings. If you are trying to design modern luxury then you don’t have to spend tens of thousands. Many modern materials are relatively cheap to acquire. We’d recommend you start with light and reflective colours and then supplement them with nice clean glass. Glass shelving works brilliantly as do glass coffee tables and mirrors. Once this is in place add in spotlighting around the room with downlights along the edges of walls and within shelving. This will combine to create a wonderfully light area that feels open but also refined and sophisticated. In terms of furniture and decorations anything clean will work well with these styles of design. Ornaments with one or two rich colours work well though you can still use antiques and art alongside this style of design. Classical luxury design can use whites and creams or rich dark colours supplemented with gold gilt and rich ornamentation. If you want to recreate the classical feel of palaces and French opulence then rich dark colours and gilts are for you. You’ll want to look for reproduction baroque furniture with extensive carved ornamentation to really capture that feel – upholstered in rich dark fabrics. 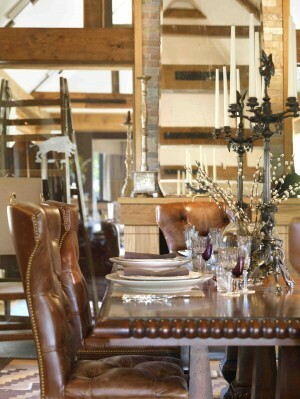 If you want a more modest elegance opt for lots of dark woods and traditional leather upholstered furniture. This create the retiring room feel that many of us crave to escape the world. In terms of ornamentation classical is surprisingly easy – rich vases, gilt framed art and antiques are your friends here and we couldn’t recommend beautiful old books enough! Hopefully these tips will start inspiring you with your own designs. And if you need help don’t hesitate to get in touch. Choosing a colour scheme for a room (or a whole house) is essential to creating an inspiring, and inspired, interior design. It is one of the fundamental things that needs to be just right if a room and a home is to come together. Here we’re going to share some of our favourite tips on creating a colour scheme that will work for you. One of the most common problems with interior design is whether to try and unify a design across a house, or apartment, or whether to treat each room individually and create a unique identity for it. Typically, for example, most of us treat bathrooms differently to bedrooms and bedrooms differently from kitchens. A lot of this comes down to personal taste. But also the style of building you have to work with makes a huge difference. As there is limited space in most flats or apartments we find that creating a unified feel across all areas makes for a much better living space – everything fits together which creates a feeling of space. Old houses tend to benefit from a greater degree of similar interior design as you tend to have old features to work with – meaning antiques and dark or light woods work particularly well as a basis for colour. New houses offer more flexibility with a typically blank canvas to work from. This lets you pick any colour scheme for each room that you choose without compromising a houses feel. The choice between dark and light colour schemes isn’t too important and most of the best interior designs blend dark and light to create a colour scheme. For example black marble works sumptuously with plain white paints or with golds and silvers. Conversely light pine can work perfectly with light blues, whites or dark purples and rich reds. One of the best options is to use a colour grouping. Rather than looking at individual colours it is often better to look at colour palettes or schemes. These are pre-arranged selections of colours that usually move from a dark colour to a light colour. These are designed to make it easier to create a unified style for any room. Work from one of these, widely available online or from an interior designer, and you will be able to choose a range of colours that complement each other. It is easy to look at a blank room and think “this shade of burgundy will look beautiful in this room” but often it is better to think of the furniture you have or want to include in the room. For example, If you have dark leather sofas these won’t be complemented by bright blue walls. It is better to look at what goes into the room – particularly large pieces of furniture – and then work towards your colour scheme. In modern homes the one real premium is always space. Whether we are creating interior designs for country houses or luxury apartments there is never enough space. One of the key challenges we take on with all interior design work is maximising the space available to you. With that in mind we thought we would share some of our best tips for increasing your space. Whenever we look at a room we like to see how much practical space can be saved using built in wardrobes, shelving and cupboards. The few centimetres that tend to fall behind most furniture and skirting boards can add a lot when taken across an entire room. Our favourite tip here is to have floor to ceiling bookcases and shelving in living areas and built in wardrobes in bedrooms. This maximises space and gives plenty of storage to declutter your rooms. Most people fail to utilise the space that we don’t actually use for living. There are vast, hard to reach, areas that are perfect for displaying art, adding a touch of aesthetic flair or for storing rarely used items. High shelves or storage cupboards are your friends here and will let you increase the actual living space and storage space available. When it comes to interior design walls are often our best canvas to create an impression but there are certain rooms where walls really can be dedicated to space saving. The most important is the kitchen where racks, hooks and magnetic strips allows you to store all your saucepans, knives and cooking utensils on the walls rather than cupboards – showing off your culinary excellence and saving space. Modern furniture often lets you mix storage with design. There are now sofas that double up as storage, bookcases and the more traditional sofa beds. There are tables that double up as entertainment centres and a variety of clever inventions to maximise space – many of which have a fantastic level of artistic and aesthetic appeal. Beds take up a lot of space that could be used for other things. Whilst you might think a bunk bed is out of the question there are now plenty of modern designs for adults that are both stylish and comfortable – including ones with TV’s and even kitchens built underneath. You can also consider suspending beds from the ceiling by building supports and platforms for them – allowing you to often double the size of small studios or one bedroom flats. How we perceive our living space contributes to the feeling of space we have. You can make a room feel bigger by increasing natural and artificial light or adding mirrors to strategic locations. You can also use natural light colours and natural objects to create a feeling of being outside and in space.